Oh yes, I hear you. Inside. That’s right. I used to go to the shopping mall or coffee shop to sit down and pray and read and write. That would be my quiet time. Although there were people around me and there was noise, I was able to have the quiet time because of the inward. Oh yes, I think I’ve seen photos of when you were at that cafe. I love little artistic cafes. I would love to have one actually. Ohhhhh, wouldn’t it be awesome? I would say sleep, it makes me feel renewed. Sleep is the love of my life 😀 Anyway I do find peace by just staring at the wall and losing myself in my very own thoughts. Thank you so much Arcane Owl. Hahaha, oh yes. I have a friend that told me once that her hobby is sleeping. I also love sleeping. So beautiful, Staci! I find it interesting that you chose flowers as having intimate meaning. I think it’s an excellent choice, since they hold the promise of return each year, blooming with natural beauty. Your painting was excellent, as was your poem. I find peace each night, mostly. That’s when everyone is tucked in and the dog is snoring. That’s when I know everyone is safe and sleeping – and that is peaceful to me. Awwww, thanks so much Rob. I had actually written this poem before. I’m actually trying to do all of my own artwork now to my poems and stuff. I’m just totally into the whole illustration thing right now. Hahaha. Your dog snores? Hahaha. That’s cute. It sounds like a very natural male instinct, where you find your peace. Knowing that your family is safe, healthy and well. Wonderful Rob. Isn’t it amazing those little flowers, each a wonderful work of art, are scattered all over, in hidden places, in public places, even where there are no (human) eyes to see them? Thanks, Staci. Beautiful picture and poem. God bless you and yours. Thank you so much Rob. Just goes to show you that God cares about beauty. Even when there’s no one there to appreciate it. Ohhh this speaks to me today in so many ways! Beautiful artwork and perfect words to go with it!!! 🙂 ❤ I've been restless lately, maybe because of the pain or letting enemy into my thoughts… Anyway, it's getting better! You're so right, there is nothing that can compare to God's peace deep inside of us, reassurance that we're OK and we're LOVED. Ahhhhhh, yes. Peaceful place in the art. And it shows too. You’re so talented. I’m so sorry you’ve been so restless. I also have been somewhat running on dry. Maybe it has to do with being sick and all, plus my routine is all out of whack at the moment. This happens at the end of the year here. The school year here ends now, Christmas stuff, my mother-in-law just arrived yesterday for a visit, etc. How is your pinched nerve anyhow? How did you treat it? That can’t be fun at all. Thank you so much Sibella. I hope you have an amazing day, with sunshine. Oh yes, I’m not very good at listening to those signs, until they get too big. Please take good care. I really hope the physical therapy helps Sibella. Awwwww, really? I’m humbled by your generous comment. Go ahead and print it if you like. Oh yes, forget-me-nots are so sweet, aren’t they. You are so sweet Vashti. Thank you so much for your sweet comment. 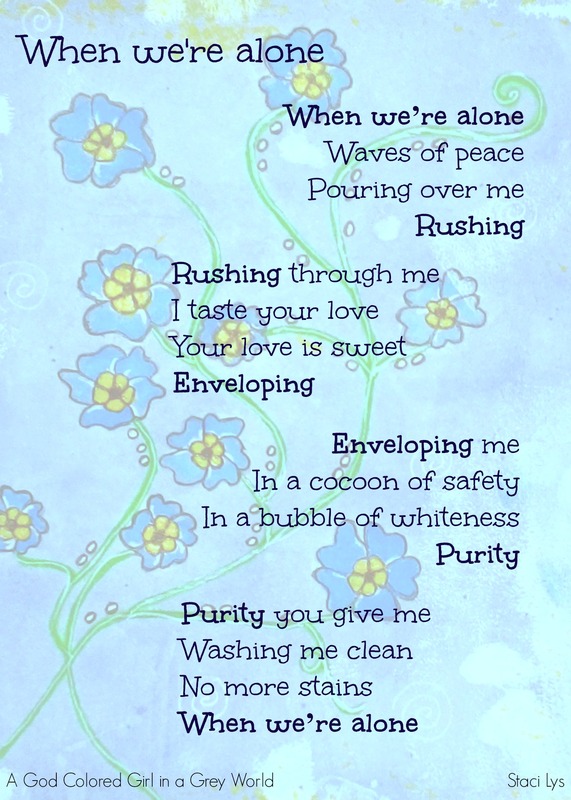 Hey Vashti, if you send me your email, I can send you the original of the poem/art piece. 🙂 If you prefer, you can send it to my email at stacilys1 at gmail dot com. Beautiful poem and painting. I find a lot of solace in nature. Thank you Tosha. Me too. When in nature things just see so much less complicated and relaxing. Another lovely post, my friend. I have several places where I find peace and solace–my recliner in the morning so I can look out at the garden and awaken to the day when I get up, Natalieworld, and of course my yard or greenhouse. Ahhhhhh yes, wonderful Natalie. We are never alone, are we? I love those meeting with the Lover of my soul. Awwww, thank you so much Lorrie. I love the water too. When I do get the chance to go to the beach, I love just floating back amongst the waves. Soooooo peaceful. You are so lucky to be close to water all year round. You must go for long walks on the beach to eh. I would love that. You also have a beautiful day Lorrie. Get out and enjoy that beach, my friend. wonderful. Yes, definitely go for drive. Your poems and flowers are beautiful, Staci. I can’t draw a straight line, very impressed with all of your art. I have a chair in the corner of my room. Most mornings I sit there, pray, meditate and read from some daily readers. My sister recently suggested I move the chair into my office. I had to tell her no. 🙂 I also find peace in nature or when I’m running alone. I usually have a little conversation with God in those quiet times when I’m open. Wonderful. I wouldn’t move the chair either. I used to have an old little wooden rocking chair that I would sit in. I no longer have it though. Maybe one day I’ll get hold of another one. Moving is good for me. I swear I have ADHD. Hahaha. Thank you so much for your kind words Geralyn. I’m so glad you enjoy my art. It’s simple, but I’m learning and loving it. I just love it. I wish I had more time to invest in it. Anyhow, I’m sorry it’s taken me so long to respond. My mother-in-law was here for a few days and my hubby traveled to Lebanon yesterday. It was very rushed here for a bit. It’s a busy time of year. I’m finding it difficult to get here to read everyone’s blogs, too. Trying to relax about that! 🙂 I don’t need another thing to stress about. Hope you had a nice visit with your MIL and got that birthday dinner with your husband! We finally got a bday dinner. Yeah! My MIL stayed with the kids on Thursday and we went out. We also had a nice visit with her. She is a wonderful person, and I consider myself super blessed to have her as a MIL. Thanks so much Geralyn. Try to stay relaxed. I’ve already got everything for Christmas for the kids, the hubby is in Lebanon, and I’m all good. Yeah! We’re not into the consumeristic Christmas thing. What’s more important is that my kids have nice family experiences for the season. Love the beautiful poem Stacey ! The painting is fabulous. I find solace sitting by the sea with the waves crushing on the rocks and for those moments, I forget all the worries in the world and feel so happy. Ohhhhh, I’m so glad you ‘love’ this Himali. Thank you so much for your kind and generous words and appreciation. I’m so sorry it’s taken me so long to respond. It’s because my mother-in-law was here and my husband just traveled to Lebanon yesterday. It’s been a bit rushed here. Things should calm down a bit now. I also think being by the sea is very comforting and peaceful. Absolutely no worries. I myself take sometimes week to reply and with the new updated WP application, I seem to have lost all my old notifications 😦 I miss replying to the old comments now. Oh wonderful. I’m so glad you have more time to blog now. You have been sooooo missed. And not just by me I’m sure, but by so many in the blogosphere. So great to have you back sweetie. You are so special and loved. Truly. I’m not just saying it. Wish you too a beautiful week ahead ! Awwwww, thank you so much Saaransh. You are such an encouragement to me. Wonderful stop for poetry and flowers. It sounds like these are places of refuge for you. Haha. Oh yes. Thank you. you asked where we find peace or true love? Peace I can find it anywhere(most of the time anyways), and normally is letting my mind roam through some creativity of the insanity or call it living in another world and write it down, then I forget about all the other problems i have in my real world. As for true love….as I say in my about page “there is no true love!” Not for me at least, which I´m pretty much have gotten use to it, plus I don´t know how I would react if I found myself really loving a person (apart from family) I´ll probably be terrible at it. Been too long since that happened. Thank you so much Charlie. I’m so glad you like it. That’s great that you can find find peace anywhere. As for true love, I think it’s a verb; an action word. I think the world has confused ‘being in love’ or ‘passion’ for ‘true love’. It’s unfortunate actually. So many broken hearts out there because of the following of feelings, instead of commitment. Hmmmmm. Have a great Sunday Charlie. This is just beautiful! Wonderful poem. Ohhhh, thank you so much Hummie. I’m so glad you think so. Awwww, thanks so much Kirsten. I actually wrote this before I knew about Loop poetry. Hahaha. Then when I found out about it, I thought of this poem and noticed that there were similarities. Hope you’re having a great season so far. Hey there. Thank you so much. I’m so glad you enjoyed this. I will definitely check out your writings. And I’m so sorry for taking so long to reply. It’s because on Christmas my daughter was sick, then yesterday I was sick, and still am. Ugh. I will be traveling tomorrow and be back on the 10th of January but will try to check out your blog before I travel.